A while back I had, to borrow a phrase from Francis, a burning desire. In my case, a burning desire to weave towels again. Three years ago I packed up my studio, literally lock, stock and barrel, and donated it to a non-profit in Cleveland. Well, I'd just find a loom and equipment to rent, and carry on. You probably see where this is going. First, there is nothing in town to rent. I called a weaver friend from long, long ago. Becky could lend me a loom, a warping board, stuff to wind a warp. Becky chains her warp and winds it on. My last chained warp, complete with pourri cross, probably was 1985. Like riding a bicycle, eh? Laura and I went to Becky's. The plan was to make chains, come back another time to dress the loom, and weave at Becky's. It took an hour to complete the first of eleven chains of forty threads, seven yards. I didn't even make it; I couldn't stand and work. Laura moved right in and began winding. She made the first, chained it and began the second. Then we loaded the loom in the car, together with a bare amount of tools, and headed home. That's the entire back story. 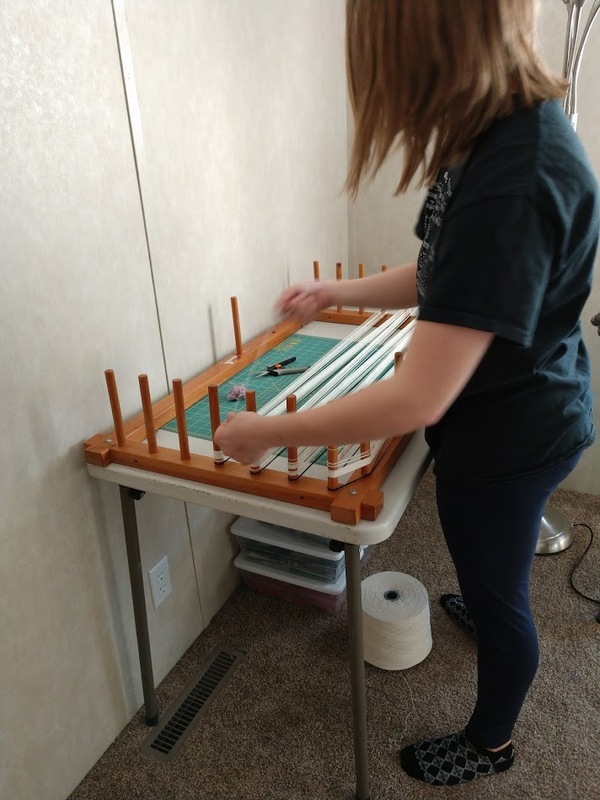 Laura winding a warp chain. Perfect pourri cross. This keeps threads in order. 440 threads assembled on lease sticks, and cat proofed for the night. We also closed the door. I spent the morning watching YouTube instructions for chain warping, front to back. Then I went to play cards. 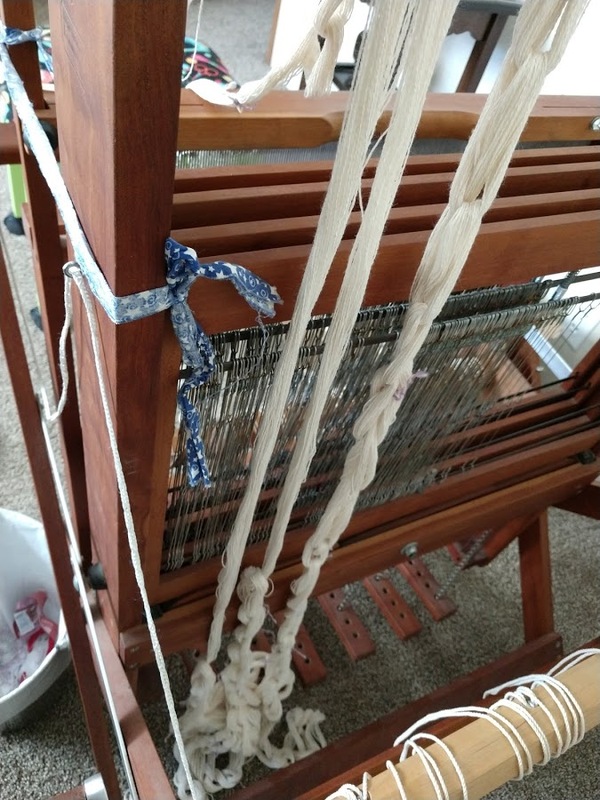 I came back and started putting the warp through the reed, after stopping on the way home to buy masking tape. I completed three sections, and quit. I believe I can thread the remaining eight and start threading heddles tomorrow. By Wednesday I should be able to finish winding the warp onto the back beam. This is why sectional warping exists. I have a lead on a LeClerc with a sectional beam. 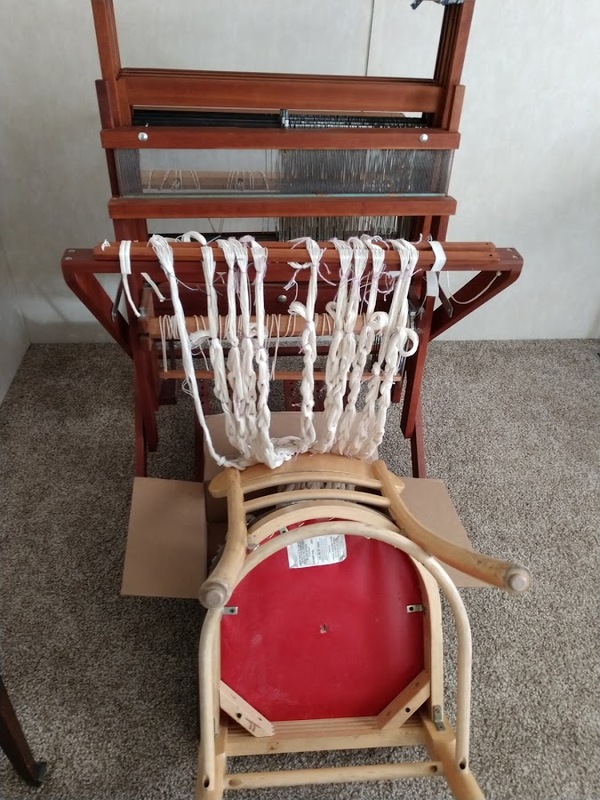 It's a jack loom, not counterbalance. But, it has a sectional already installed. 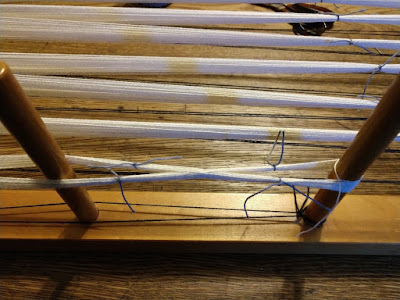 Tomorrow I will call Leesburg Loom and see if they can build me a forty peg warping tree. 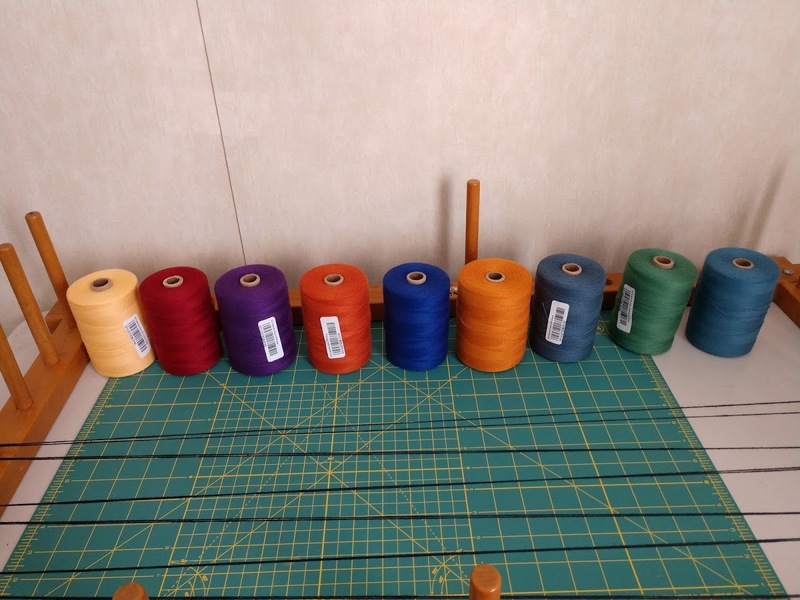 If yes, I will purchase forty warping bobbins and an electric bobbin winder. And the LeClerc loom with the sectional beam. My shuttle came today. 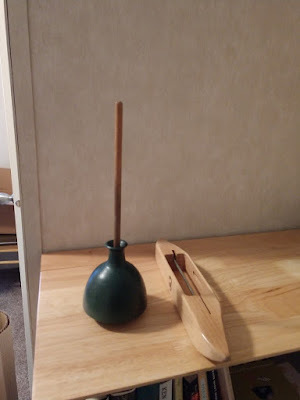 The weaving bobbins probably will come tomorrow. 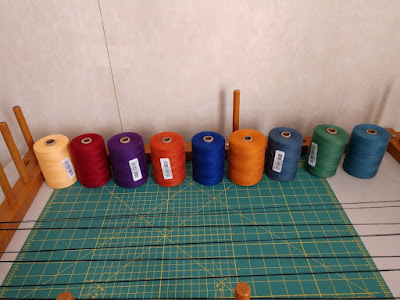 How about my spool holder! I took it to cards this afternoon, and Greg said Sure, he can make a real one, a half inch dowel stuck in a foot square, flat base. Towel weft came today, too. Each spool is a pound, and good for about a dozen towels apiece. Unfortunately, the chain warp is maxed out at seven yards, or six towels. I'm a pretty bad sport about doing easy things the hard way. I'm sure by noon I will own a forty pin warping tree and a LeClerc jack loom. "Just when I think I'm out, they pull me back in again!" said Michael Corleone of the Mob. I see that weaving is similar. I love, love the towels you made and gave to me. They are on almost permanent rotation. And hope that you can get everything you need - quickly and easily. Oh, you make me laugh. I gave both my looms and all my accoutrements away. Sometimes I miss them. My guess is you gave all 'the tools of the trade' away and now have a lusting to start again - and are going to the ends of the earth to make it happen again. Right ?? I use the lovely towels that you gave me every day. It was a gift that I truly treasure. Wow Joanne. You really impress me. I've never learned to weave and I admire anyone who can do so like you have done. I still have and use and enjoy the towels you gifted me with. I will buy some from you if you make some. Seems like weaving is in your blood so to speak! Good luck with your new venture back into it; seems like you are getting as prepared as you can to weave the towels. I am proud to own a couple of your towels, Joanne. too many times I have dispensed with something and then wished I had it back, like all my baking kitchen stuff in Florida when I had to become gluten free, little did I know back then that I could bake with gluten free flour, now slowly reacquiring via yard sales, good for you, I love my towel you gave me. It is always good to have big plans,you are an expert Joanne. You are very ambitious and in a hurry too. All the best. And she's back. Some things you just can't get out of your blood. I am smiling at your determination, Joanne. Good luck! Nice to see you weaving again, the towels colours look great. 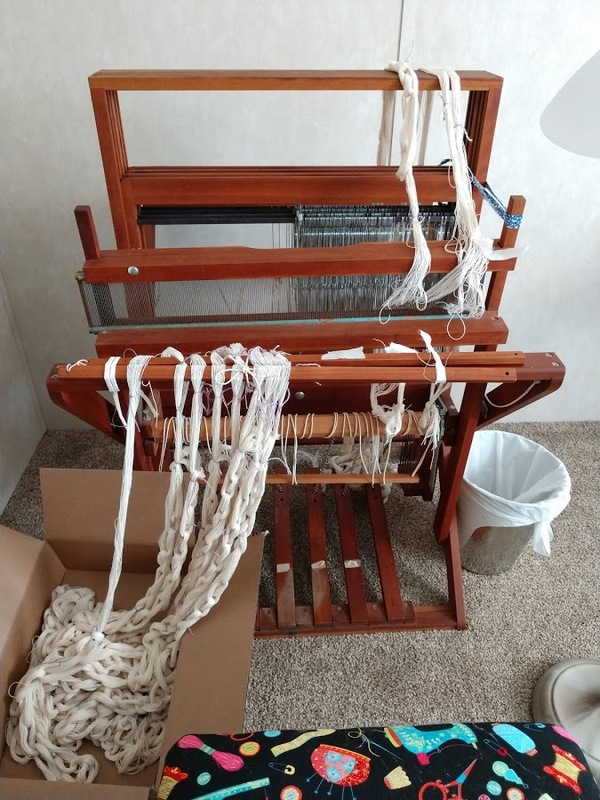 Will Laura learn to weave too? it looks complicated to me, but it's probably easy for those who know how. I think she would like to have the opportunity. I could not read all of this as it is too cumbersome for my brain. I have no idea how you can do this work. I am totally flummoxed by your ability. You do enjoy weaving. Where would you put the larger warping tree and loom? I am sure space is limited. This all looks incredibly complicated Joanne. Don't think I could begin to understand the technique. Why does this not really surprise me? :) And thank you once again for the towels you sent me. Even with a dishwasher, there are many things I have to wash by hand, so I'm definitely using them and expect to still be doing so many years into the future. I sympathise with the difficulty with standing for long. My physiotherapist suggested my trying a Tripp Trapp toddlers chair in the kitchen and, oddly enough, it really helps. They're expensive but easy to find second hand. I love my towels you sent, thank you again. You make me want to find a weaver and learn. The towel that binds! How fun to see old friends popping up like corks. Sounds like a nice activity for a retiree. Oh the shop talk going on in this post. Do the number of pins on your warping tree make you a better weaver? Maybe even a badass weaver? I am so impressed! I had a friend who did some weaving. I think I still have a bath mat she made. You're amazing! Goodness, that all looks very skilled. I'm far too lazy to try anything similar! Ah, good for you, Joanne!